Pilgrim Scribblings: Who's Your Guru? Just thought I'd have a little fun with this site where you can add your own captions to the banners provided. The sad fact is that I could get a couple of weirdos to walk around with a banner and people would join, sign up or pledge their allegiance to any off-the-wall group or religious sect. 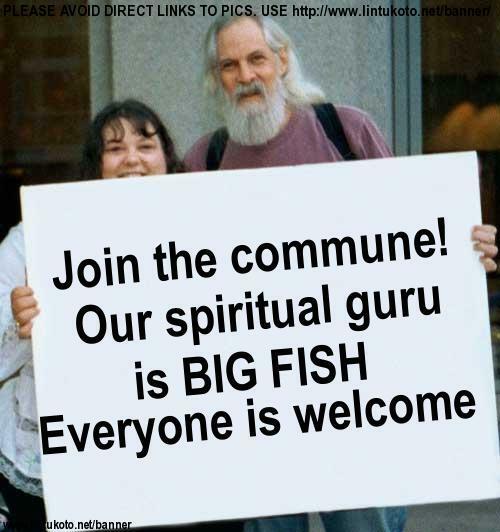 I could be the self-proclaimed leader or guru of that group and people would believe anything I said and give away their life savings if I asked them too. I'm grateful that I didn't have to join some left-wing group of hippies or some extremist bunch of wackos to obtain peace. Can I Visit You Brodie?